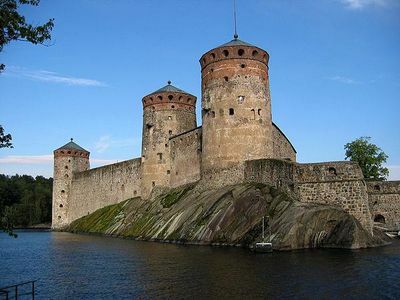 Savonlinna Opera Festival is held annually in the city of Savonlinna in Finland. The Festival takes place at the medieval Olavinlinna , built in 1475. The castle is located amid spectacular lake scenery. The birth of the Savonlinna Opera Festival ties in closely with the emerging Finnish identity and striving for independence at the beginning of the 20th century. Attending a nationalist meeting in Olavinlinna Castle in 1907, the Finnish soprano Aino Ackté, already famous at opera houses the world over and an ardent patriot, immediately spotted the potential of the castle as the venue for an opera festival.